Lewistown Air Force Station (1958-1971) - A Cold War Air Force Radar Station first established in 1958 on Judith Peak near Hilger, Fergus County, Montana. The cantonment area and housing areas were located below the operations area, near the ghost town of Maiden, Montana. Named Lewistown Air Force Station after the nearby town of Lewistown. Initially assigned a Permanent ID of TM-178 and later a Sage ID of Z-178. Abandoned in 1971. Lewistown Air Force Station Upper Site. Established in 1958 as Lewistown Air Force Station manned by the 694th AC&W Squadron. Construction was completed in April 1959 and the site went operational on 15 Feb 1960 as a manual AC&W site. The station initially had both a Ground-Control Intercept (GCI) and early warning mission. The early warning mission involved tracking and identifying all aircraft entering their airspace while the GCI mission involved guiding Air Force interceptors to any identified enemy aircraft. Controllers at the station vectored fighter aircraft at the correct course and speed to intercept enemy aircraft using voice commands via ground-to-air radio. Initial equipment included the FPS-3A search radar and one FPS-6A height-finder radar. A FPS-90 height-finder radar was added in 1961. The FST-2 was a very large digital system using vacuum tube technology. Over 6900 vacuum tubes were used in each FST-2 requiring 21 air-conditioned cabinets, 40 tons of air conditioning, 43.5 kva of prime power and usually a large new addition to the operations building. The FST-2B modification added two more cabinets but with newer solid state (transistor) technology to process coded responses from aircraft transponders. The FST-2 at Lewiston AFS was located on the upper site adjacent to the operations area. The site began operation as a SAGE site on 1 Mar 1961 feeding the Malmstrom SAGE Direction Center DC-20 at Malmstrom AFB. The FPS-3A radar was replaced in 1963 with a FPS-66 search radar that was upgraded to a FPS-66A configuration in 1966. The FPS-90 height-finder was removed from service in 1968 leaving the site with a single height-finder. Lewistown AFS and the 694th were deactivated on 30 Jun 1971. 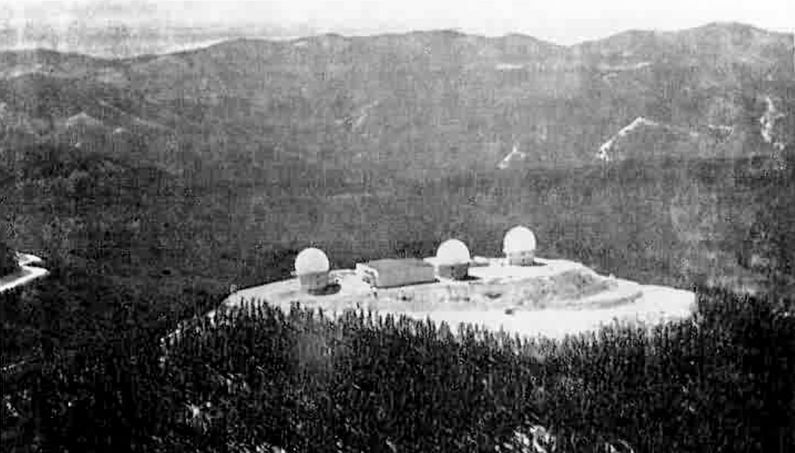 The physical plant of the site was divided into an upper radar/operations site on Judith Peak, a separate GATR radio site on Red Mountain and a lower site with the cantonment area and two housing areas. A modern grade school built by USAF, operated by the Lewiston School District and staffed by three teachers was built just up the road from the lower site. This school served the Air Force dependents and local children as well. Dependent high school student were transported to Lewiston high schools. Upper site Radar and Operations Area. The upper radar/operations site housed the operations building, communications center, the radar towers and the backup generators. The lower cantonment area housed the support functions including the enlisted barracks, the bachelor officer's quarters, the orderly room, the mail room the dining hall, the motor pool and other support activities. The dining hall seated 65 personnel providing four meals a day, breakfast, lunch, dinner and a midnight meal for shift workers. A hot noon meal was prepared in the dining hall and transported to the upper site for topside shift workers. Apart from the cantonment area were two housing areas. A seven unit housing area was provided for officers and senior NCOs. A separate twenty unit housing area was provided for lower ranking NCOs and airmen. A separate upper GATR radio site was built on Red Mountain in 1960 to housed the radio equipment for directing aircraft intercepts. Contract cost of the GATR Site was $256,166 for a 26 by 113 foot masonry block building and 1.5 miles of access road. The GATR site was about three miles from the main upper site. 13* Auto Hobby Shop ?? * Not the actual building numbers but reference numbers to the plan. 8 Aug 1958 - Activated at Malmstrom AFB, MT, assigned to 29th AD. 1 Mar 1961 - Redesignated from AC&W Sq to 694th Radar Sq (SAGE). 30 Jun 1971 - Inactivated. Private property. Many buildings remain in the cantonment area and just a few in the family housing area. The upper radar/operations site and the GATR radio site buildings have been mostly demolished. The upper site now serves as a communications site. The cantonment area and the housing areas were used for a time as the campus of the Big Sky Bible College. Satellite views of the lower site show many of the cantonment area buildings still existing although both barracks are demolished with only the foundations showing. A few homes remain in the large housing area while only one remains in the smaller housing area. The school building appears intact. Two buildings remain on the main upper site that were in use during the operational period, one building was used as the Telco/microwave terminal. The other building was located alongside the operations building and now is within a small fenced in compound with air-ground radio antennas surrounding it. This may be a FAA remote radio site. The Operations building and the three radar towers are completely demolished. The GATR site on Red Mountain has been demolished. Location: Cantonment and housing areas on Maiden Road in Fergus County, Montana, 17 Miles from Lewistown. Operations area located on Judith Peak. Winkler, David F., Searching the Skies: the Legacy of the United States Cold War Defense Radar Program, USAF Hq Air Combat Command, 1997, 192 pages, Pdf, page 132. Cornett, Lloyd H. & Johnson, Mildred W., A Handbook of Aerospace Defense Organization (1946-1980), Office of History ADC, Peterson AFB, Colorado, 31 Dec 1980, 179 pages, Pdf, page 161. This page was last modified 20:56, 7 January 2019 by John Stanton.